Everyone's favorite street is Sesame Street! Attract attendees and keep them entertained with the licensed Sesame Street Jump. Crisp, digital artwork shows Big Bird, Elmo, Oscar the Grouch, Abby Cadabby, Cookie Monster, Zoe, and Rosita as they beckon passers by to come and join the fun! These loveable Muppet characters are recognized around the world, as well as the famous name of Sesame Street. 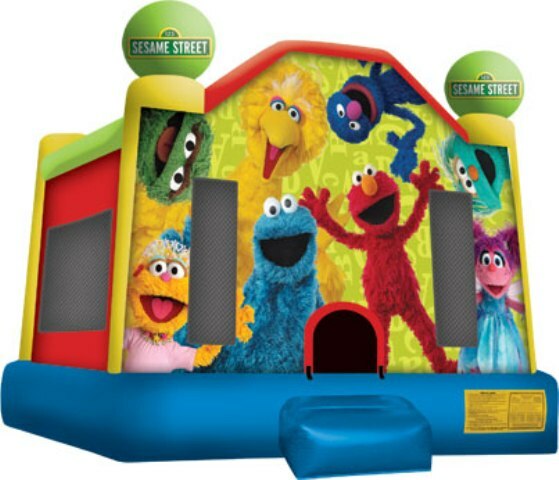 Participants can bounce to their heart's content in this bounce house, which is part of a popular licensed line of Sesame Street inflatable products.